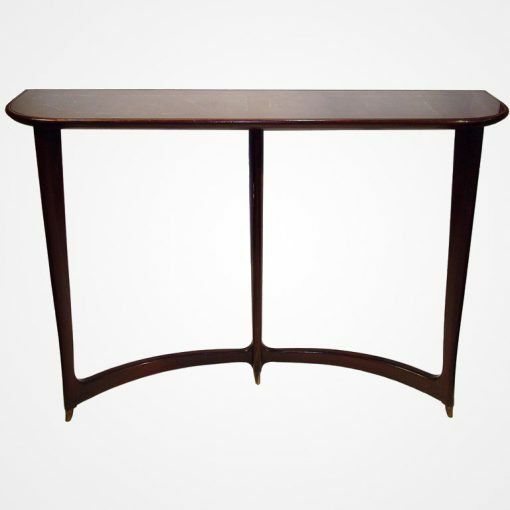 Exceptional mahogany console table by Guglielmo Ulrich. Completely original. Graceful, curved stretcher joins the tapering legs. Original reverse painted glass top in deep burgundy. Finished with brass sabot. Completely original and untouched. Glass top shows beautiful age appropriate patination. Documented in Il Mobile Italiano Degli Anni ’40 e ’50 by Guttry and Maino, page 270, and AA. VV. “Ulrich gli oggetti fatti ad arte”, Electa 1994 page 86.